What will generation Y need to do to save for a mortgage? In 1983, a first time buyer’s house price was 2.5 times their average wage across the UK according to Nationwide with London slightly higher: just over 3 times the average wage. The Telegraph reported last month that in 2015 first time buyers in London faced house prices that are 10 times their average wage. Across the UK the average is five times wages. Since the 2008 crash and the Mortgage Market Review which looked at affordability and criteria for lending, most mortgage companies will only lend a maximum of four times a buyer’s salary, and in some cases 5 times, depending on the size of the deposit. In quarter two of 2010, Nationwide found that in spite of the recession, average London house prices were 6.5 times wages of first time buyers. However, in the last five years, house prices in London have multiplied another 3.5 times which is the same increase as in the previous 27 years all together. The average age of a first time buyer is 31 according to research conducted by the Times’ Money team. The unemployment rate for people aged 18-24 was 12.2% in December-February 2016, down from 14.3% the year before. 499,000 18-24 year olds were unemployed. Younger households are facing particular difficulties in accessing home ownership according to the Office of National Statistics. The percentage of young adult householders owning their home decreased from 55% in 1996 to 30% in 2015 for 25 to 29 year olds; and from 68% to 46% for 30 to 34 year olds. 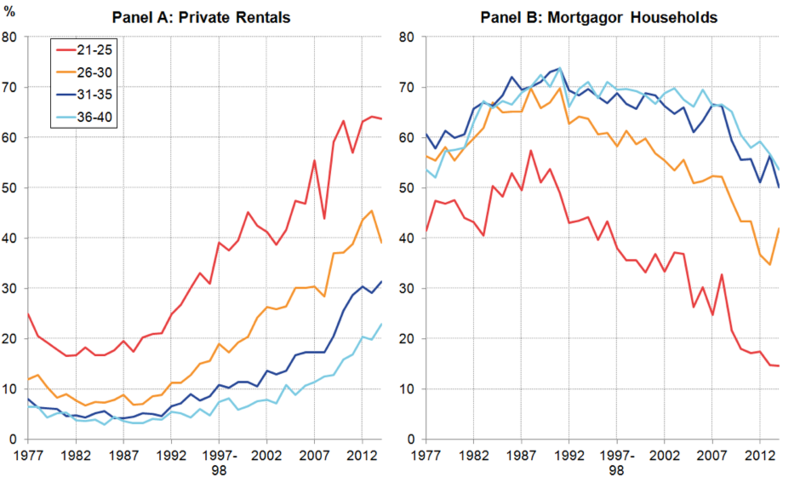 The earlier data in the graph below shows a similar decline in home ownership of all groups under the age of 40. It was also collected by the Office of National Statistics. What should young people do? Gen-Y will need to find well paid, secure work in order to raise a mortgage. As we all know, this is easier said than done. Public service offers security but with relatively low pay. When people leave the armed forces, 22% look at self-employment. Self-employed mortgagees must already submit three years of accounts to the mortgage company. This is a challenge for young people and those entering the labour market as freelancers and contractors, on short-term or fixed-term contracts. Gen-Y start off their working lives with higher debt than any other country. They struggle to pay off student loan debt while on low incomes and, since the advent of tuition fees, student debt has snowballed for gen-Y across England and Wales. Consequently, gen-Y are over reliant on parents for help with a deposit and many live at home in their twenties or find themselves renting into their 50s because they don’t have the savings or income to support a mortgage. Paying rent and saving for a mortgage at the same time is a tall order, particularly in Cities and the South East. At least two thirds of first time buyers back in 2014 said they could not afford to buy a house without turning to the “bank of mum and dad”, double the amount five years earlier, according to the National Housing Federation. Hamptons International produced a Time to Save report in April this year outlining the problems facing first time buyers and the regional variations. However, there are big implications for parents who arrange a joint mortgage to help their children, making them liable for a 3% stamp duty levy applied to the whole purchase price. * This will add £10,000 on average to a parent’s tax bill because the child’s home is considered a parent’s second home if their name is on the mortgage. Giving money away as a deposit also has heavy inheritance tax implications if the giver doesn’t live for another 7 years. Our advice - take professional financial and tax advice. We hope to able to provide you with that in the future - subject to our regulatory journey. Watch this space for more information about mortgages from the Services Family Bank, helping the whole of your family.